In a tiny Plaza Midwood strip-mall is a tiny shop where you’ll meet tiny, friendly Diana Ahenkoro. Her Quality & Convenience African Store sells a little bit of everything from Ghana, her home country on the west coast of Africa. On the walls hang bundles of imported cotton cloth printed in splashing colors. Racks hold elaborately hand-worked dresses by Diana’s friend Queen Stansberry, who will also happily whip you up a custom frock to your exact wishes. Shelves hold bottles of palm oil, jars of hand-ground pepper, tubes of hair pomade, boxes of baby medicine (“best to cure wind and gripe”), cans of African food. And near the counter are little plastic bags hand-packed with chin-chin. What’s chin-chin? It’s the most popular snack food in Ghana and next-door Nigeria. Flour, sugar, eggs, butter and nutmeg are deep-fried into crunchy little cookies. 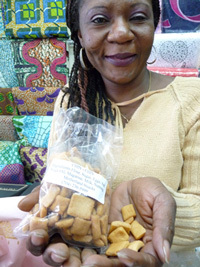 These aren’t imported — a Nigerian friend of Diana’s hand-makes them right here in Charlotte. Nibble one and you’ll want another. And another.